Power line noise can make a real train wreck out of an otherwise very interesting and compelling hobby. Several hams are fortunate enough to be able to solve power line noise problems at the source. In other cases where it is not possible to locate and fix the offending source the ham is left to other solutions. This post describes how I use the DX Engineering Receive Antenna Variable Phasing Controller - DXE-NCC-1 to combat the power line noise I get in my shack. I have written several posts on my ongoing power line noise and these may be of interest. The image below shows the NCC-1 on my radio desk. It is not as small as one might expect as compared to perhaps a related product from MFJ, but it is a nice looking accessory, and fits in very well. The all controls are easily manipulated due to their generous size. In particular the Phase control knob, which is the large dial on the right reflects it's importance in the entire concept, second only to the balance control. Attenuation B, sets the attenuation for the signal form Antenna port B. 4 settings are available, 0dB, -10dB, -20dB and -30dB. In my setup I use a secondary un tuned (arbitrary length) dipole fit up in the attic. Phase, Controls the relative phase of the attenuated and balanced antenna port signals at the combiner in the unit. The unit is bypassed when the Rx port on the FT2000 is not engaged. One push of the Rx port button on the FT2k sends the FT2k main antenna signal to the antenna A input on the NCC-1, where it is balanced and added to a phase adjusted to the NCC-1 antenna B input. Antenna B input comes from the simple noise `Dipole`. The hopefully improved sum is sent back to the FT2k. The external housing, internal PCB and layout, component placement all point to a design which appears well thought out and mature. The rear apron has inputs for the 2 input antenna ports, one RF output port and a 12V DC input power plug. Before I describe the plot below, I should write a few words on tuning. The main outdoor 80m windom antenna is much larger than the 20ft noise dipole in the attic and so the signal from the main antenna 20dB stronger. I usually go through the following steps. Set the main antenna attenuator (A) to -30dB. and place the balance control (BAL) to center. Set the noise antenna attenuator (B) for 0dB and make a note of the noise level on the S meter and then set the attenuator (B) to -30dB. Advance the main antenna attenuator (A) until approximately the same noise level is seen on the S-meter. This typically results on a setting of -20dB. Advance the noise attenuator (B) to 0dB. Now what is left is to fine tune to cancel out the power line noise. Usually a sweep of the phase control will show a dip in S meter and audio noise level. As best as possible set the phase at this value. Now a sweep of the balance will also locate a deeper dip in noise level. A second iteration of one more phase adjustment and balance will usually locate a sharp cancellation setting. Like tuning up the old tube rigs, it takes some time to become accustom to the above procedure, but practice yields repeatable results. 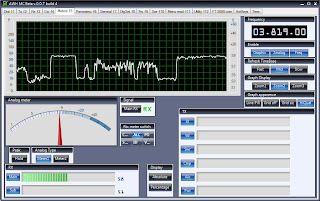 The plot below is a log of my S-Meter while a QSO I was monitoring was in progress. The first block at the left of the trace shows a S9+ noise level with the noise canceller disabled. Shortly after, the S-meter readings drop to about S3, this is when I engaged the canceller. During the main part of the plot, you can see a speech pattern from the QSO, including the S3 noise levels between his words. As you can expect, copy is next to impossible with the canceler not engaged. The QSO is below the noise level. Engaged is a very different story, although the cancellation is not perfect, the QSO is 4 to 5 S-units above the cleaned up noise floor and is very copyable. Great instrument. How old is this?